7 Places To Watch On Election Day : It's All Politics Whether it's because of their size, demographic make-up, or the unique role they play, these places will have an outsized role in state — and possibly national — politics this year. Florida Democratic gubernatorial candidate Charlie Crist, center, gets a kiss from a supporter after he stepped off his bus during a brief campaign stop at Delevoe Park in Fort Lauderdale, Fla., on Oct. 25. For all the money spent, doors knocked, ads aired and miles traveled by candidates this year, the 2014 elections will likely come down to the votes cast by a relatively small universe of places. Whether it's because of their size, demographic make-up, or the unique spot they occupy, these places will have an outsized role in state — and possibly national — politics this year. The Denver metropolitan area was carpet-bombed with political ads this year — with 78,400 ads aired here from January to October, no media market saw more ad volume. The Senate race between Democratic incumbent Mark Udall and GOP Rep. Cory Gardner was one reason, but the saturation advertising also reflected Democratic Gov. John Hickenlooper's tight re-election campaign and one of the nation's most competitive U.S. House races in the 6th District. With roughly 40 percent of the state's registered voters — many of them unaffiliated — clustered in Denver and suburban Adams, Arapahoe and Jefferson counties, some of the nation's most closely watched elections will live and die here. There's really no question about the place to watch in Kansas on Election Day: Johnson County. Located on the outskirts of Kansas City, this suburban county is the most affluent in the state, the most populous and it's home to more registered Republicans (and independents) than any of Kansas' other 104 counties. This year, Johnson County will play an important role in determining the outcome in three statewide elections with national implications and a Republican-controlled U.S. House seat that has made the GOP more nervous this year than it should be. A frequent battlefield in the longstanding war between Kansas GOP moderates and conservatives, the county is poised to play an especially significant role in the Senate contest: It's home to Greg Orman, the independent candidate who's tied with GOP Sen. Pat Roberts in the polls. Roberts hails from the other side of the state — western Kansas — but he won here by a wide margin in 2008. Only one other media market saw more political ad volume than Denver this year — Little Rock. It's easy to understand why — there's a competitive Senate contest between incumbent Democrat Mark Pryor and GOP Rep. Tom Cotton, an open governor's race and an open U.S. House seat up for grabs this year. Little Rock's Pulaski County is one of just two in Arkansas that voted for Barack Obama in 2012. With a population that's roughly one-third African-American, a strong Democratic performance here is essential to Democratic hopes. Home to Fort Lauderdale, South Florida's Broward County is a Democratic behemoth. There are 545,000 registered Democrats here — they outnumber Republicans by more than 2-to-1 — and then there's another 269,000 unaffiliated voters. The Democrats' problem here is that the county has a history of steep drop-offs in voter turnout in midterm elections. In 2012, for example, the presidential election sparked a 67 percent turnout. But in 2010, when Republican Rick Scott won the governorship, turnout was just 41 percent. To knock off Scott this year, Democrat Charlie Crist will need a better performance from Broward than in past midterm years. 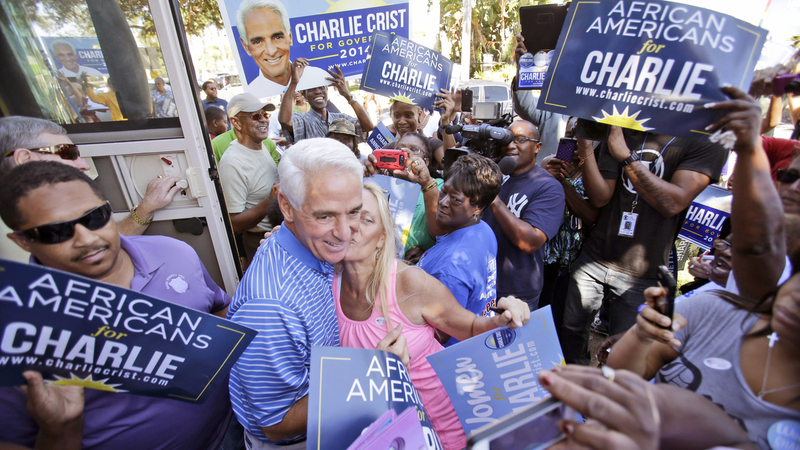 Democrats have a more extensive field operation in the county this year — and Crist has paid very close attention to South Florida — but his chances could depend on buy-in from several of Broward's voting blocs: African-Americans, Hispanics, immigrants from the Caribbean and the county's so-called "condo commandos," a largely diminished, though still relevant group of politically engaged senior citizens. To have any hope of winning re-election in increasingly red Louisiana, Democratic Sen. Mary Landrieu needs a strong turnout from African-American voters — particularly in New Orleans, the state's largest city. A big showing in majority black New Orleans wouldn't be a stretch for her: Landrieu's brother is currently the mayor, a position her father once held as well. In Landrieu's 2008 re-election campaign, the three-term senator won 84 percent of the city vote — well above her 52 percent statewide performance. And amid many grim reminders of the tough predicament Landrieu finds herself in this Republican year, there's at least this promising news: Election officials in Orleans Parish report a surge in early voting over 2010 figures, which suggests a solid African- American turnout. Georgia's second-most populous county — after Atlanta's Fulton County — Gwinnett is a key indicator to watch in the state's competitive Senate and gubernatorial races. It's the most racially diverse county in the state — at 11 percent, it has the highest Asian population in Georgia — and as Gwinnett has diversified, it's has shed its status as a GOP stronghold and become increasingly competitive. A decade ago, Gwinnett delivered 66 percent of its vote to President George W. Bush. By 2012, GOP nominee Mitt Romney only mustered 54 percent there. Hillsborough, the state's most populous county and home to Manchester and Nashua, is critical to GOP aspirations in New Hampshire this year. Its presence won't just be felt in the Senate and governor's races — it will also determine the outcome in one of nation's bellwether U.S. House races. Any path to victory for Republican Scott Brown in his challenge to Democratic Sen. Jeanne Shaheen goes through Hillsborough, which borders Massachusetts to the south and is filled with residents sometimes referred to as "Massplants." How swingy is Hillsborough? It twice voted narrowly for George W. Bush before doing the same for Barack Obama.